This week, my work came full circle when I personally felt the incredible reach of the American Red Cross firsthand. For the past 10 years I have worked for Blood Services as a communicator and volunteered to deploy during disaster relief efforts. I have deployed 14 times during which I have responded to tornadoes, hurricanes and other tragedies on a moment’s notice. Most recently I was in New York City in the aftermath of Superstorm Sandy and I spent a week in Newtown Connecticut assisting in the community after the unimaginable school shooting at Sandy Hook Elementary School. Earlier this week, I was at work at the Red Cross in Dedham when I received news no one wants to hear. My condominium complex was engulfed in flames. Four units were a total loss. Luckily my condo which was 100 feet away was intact other than a little smoke damage. A young mother fled the building with an infant in her arms. Another resident ran into the bitter cold in his bare feet. The Red Cross responded and we were grateful for their support. Two days later the February Blizzard was a looming threat in the Northeast. I decided to ride it out on the Cape where I have a home with my German Shepard Sebastian. One of my fellow Red Cross colleagues Jecoliah came to my condo as well. The Cape was expected to experience less of an impact than Greater Boston but we thought we could pre-position in case we needed to help after the storm made landfall. My condo rattled and rolled with the high winds. We lost electricity and faced bitter cold conditions. It was 45 degrees inside and we bundled up until it was safe to get on the road. We could see our breath in the air and all we could do was hunker down and wait. When it was safe to do so we went to a shelter to get warm and have a bite to eat. While we were there we were able to work with the media to show the good work of the Red Cross, emergency management and partner agencies. So here is an open message to all Red Cross workers who are unwavering in their dedication from a grateful recipient of your services. Your work matters and from the bottom of my heart thank you for all that you do. You respond in a moment’s notice and put everything aside to answer the call for help. This week, my neighbors and I received Red Cross support in our hour of need in both communities in which I reside. God bless you for making a difference in the lives of others. 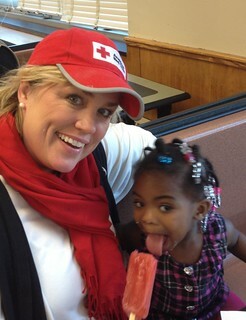 And this Red Crosser is proud to stand beside you with arms wide open!